Reading the excellent book I Am Error, I've recently become interested in the technical aspect of how many Famicom games used backgrounds to create the illusion of screen-filling bosses. 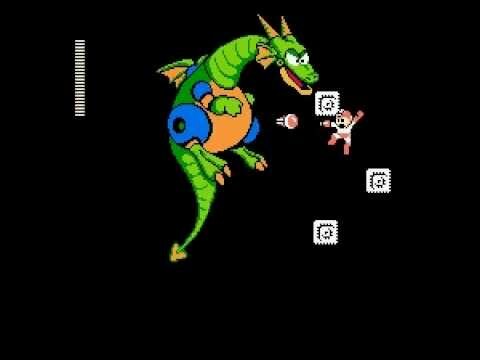 You know the ones - the Mecha Dragon in Megaman 2 or the Stage 1 Helicopter boss in Journey to Silius. I'd like to compile a list of all the games to feature bosses that use the background to create much larger enemies than typical sprites would allow. I'll start with the examples I can think of. Please add your own so I can hopefully create a somewhat complete list. Ninja Cop Saizou/Wrath of the Black Manta AFAIK? Joe 'N' Mac caveman Ninja is another one I think. Yeah screen-filling bosses are popular and, due to the 8-sprites-per-scanline limit, about any large object that is more than 8 sprites wide (each sprite is 8x8 PPU pixels, Rockman is 3 sprites wide) and isn't flickering, probably consists at least partly of BG tiles. Especially in horizontally scrolling games where the player sprites (and possibly bullets) will be on the same scanlines as the object, reducing the amount of possible sprites even further. Yeah, I know this would be huge and near endless if it included all genres. I'm mostly talking about action games, not any turn based RPGs or the like. Obviously almost all of them use the background for bosses and enemies. I'm strictly talking platformers, shooters, puzzlers etc. The typical "the background turns pitch black and here comes a foe" kind of NES games. I've added each game mentioned to the first post master list. Titles are listed by their NES titles where applicable.